1 B None No Power Seat 1 B is a standard Delta One Open Suite, however, the proximity to the lavatories and galley may be bothersome. 1 C None No Power Seat 1 C is a standard Delta One Open Suite, however, the proximity to the lavatories and galley may be bothersome. 2 A None No Power Seat 2 A is a standard Delta One Open Suite. 2 B None No Power Seat 2 B is a standard Delta One Open Suite. 2 C None No Power Seat 2 C is a standard Delta One Open Suite. 2 D None No Power Seat 2 D is a standard Delta One Open Suite. 20 A None No Power Seat 20 A is a standard Delta Premium Select Class seat that has extra legroom due to the position of the bulkhead. There is no floor storage for this seat during takeoff and landing. The tray table and inflight entertainment monitor are in the armrest, making the armrest immovable and slightly reducing seat width. 20 B None No Power Seat 20 B is a standard Delta Premium Select Class seat that has extra legroom due to the position of the bulkhead. There is no floor storage for this seat during takeoff and landing. The tray table and inflight entertainment monitor are in the armrest, making the armrest immovable and slightly reducing seat width. 20 D None No Power Seat 20 D is a standard Delta Premium Select Class seat that has extra legroom due to the position of the bulkhead. There is no floor storage for this seat during takeoff and landing. The tray table and inflight entertainment monitor are in the armrest, making the armrest immovable and slightly reducing seat width. 20 E None No Power Seat 20 E is a standard Delta Premium Select Class seat that has extra legroom due to the position of the bulkhead. There is no floor storage for this seat during takeoff and landing. The tray table and inflight entertainment monitor are in the armrest, making the armrest immovable and slightly reducing seat width. 20 F None No Power Seat 20 F is a standard Delta Premium Select Class seat that has extra legroom due to the position of the bulkhead. There is no floor storage for this seat during takeoff and landing. The tray table and inflight entertainment monitor are in the armrest, making the armrest immovable and slightly reducing seat width. 20 G None No Power Seat 20 G is a standard Delta Premium Select Class seat that has extra legroom due to the position of the bulkhead. There is no floor storage for this seat during takeoff and landing. The tray table and inflight entertainment monitor are in the armrest, making the armrest immovable and slightly reducing seat width. 20 H None No Power Seat 20 H is a standard Delta Premium Select Class seat that has extra legroom due to the position of the bulkhead. There is no floor storage for this seat during takeoff and landing. The tray table and inflight entertainment monitor are in the armrest, making the armrest immovable and slightly reducing seat width. 20 J None No Power Seat 20 J is a standard Delta Premium Select Class seat that has extra legroom due to the position of the bulkhead. There is no floor storage for this seat during takeoff and landing. The tray table and inflight entertainment monitor are in the armrest, making the armrest immovable and slightly reducing seat width. 21 A None No Power Seat 21 A is a standard Delta Premium Select Class seat. 21 B None No Power Seat 21 B is a standard Delta Premium Select Class seat. 21 D None No Power Seat 21 D is a standard Delta Premium Select Class seat. 21 E None No Power Seat 21 E is a standard Delta Premium Select Class seat. 21 F None No Power Seat 21 F is a standard Delta Premium Select Class seat. 21 G None No Power Seat 21 G is a standard Delta Premium Select Class seat. 21 H None No Power Seat 21 H is a standard Delta Premium Select Class seat. 21 J None No Power Seat 21 J is a standard Delta Premium Select Class seat. 22 A None No Power Seat 22 A is a standard Delta Premium Select Class seat. 22 B None No Power Seat 22 B is a standard Delta Premium Select Class seat. 22 D None No Power Seat 22 D is a standard Delta Premium Select Class seat. 22 E None No Power Seat 22 E is a standard Delta Premium Select Class seat. 22 F None No Power Seat 22 F is a standard Delta Premium Select Class seat. 22 G None No Power Seat 22 G is a standard Delta Premium Select Class seat. 22 H None No Power Seat 22 H is a standard Delta Premium Select Class seat. 22 J None No Power Seat 22 J is a standard Delta Premium Select Class seat. 23 A None No Power Seat 23 A is a standard Delta Premium Select Class seat. 23 B None No Power Seat 23 B is a standard Delta Premium Select Class seat. 23 D None No Power Seat 23 D is a standard Delta Premium Select Class seat. 23 E None No Power Seat 23 E is a standard Delta Premium Select Class seat. 23 F None No Power Seat 23 F is a standard Delta Premium Select Class seat. 23 G None No Power Seat 23 G is a standard Delta Premium Select Class seat. 23 H None No Power Seat 23 H is a standard Delta Premium Select Class seat. 23 J None No Power Seat 23 J is a standard Delta Premium Select Class seat. 24 A None No Power Seat 24 A is a standard Delta Premium Select Class seat. 24 B None No Power Seat 24 B is a standard Delta Premium Select Class seat. 24 D None No Power Seat 24 D is a standard Delta Premium Select Class seat. 24 E None No Power Seat 24 E is a standard Delta Premium Select Class seat. 24 F None No Power Seat 24 F is a standard Delta Premium Select Class seat. 24 G None No Power Seat 24 G is a standard Delta Premium Select Class seat. 24 H None No Power Seat 24 H is a standard Delta Premium Select Class seat. 24 J None No Power Seat 24 J is a standard Delta Premium Select Class seat. 25 A None No Power Seat 25 A is a standard Delta Premium Select Class seat. 25 B None No Power Seat 25 B is a standard Delta Premium Select Class seat. 25 D None No Power Seat 25 D is a standard Delta Premium Select Class seat. 25 E None No Power Seat 25 E is a standard Delta Premium Select Class seat. 25 F None No Power Seat 25 F is a standard Delta Premium Select Class seat. 25 G None No Power Seat 25 G is a standard Delta Premium Select Class seat. 25 H None No Power Seat 25 H is a standard Delta Premium Select Class seat. 25 J None No Power Seat 25 J is a standard Delta Premium Select Class seat. 3 A None No Power Seat 3 A is a standard Delta One Open Suite. 3 B None No Power Seat 3 B is a standard Delta One Open Suite. 3 C None No Power Seat 3 C is a standard Delta One Open Suite. 3 D None No Power Seat 3 D is a standard Delta One Open Suite. 30 A None No Power Seat 30 A is a standard Economy Class seat that has extra legroom due to the position of the bulkhead. Delta designates this seat as a Preferred Seat, which is reserved for Delta Medallion members. This seat may be selected by Medallion members at time of booking or afterwards. This seat becomes available to all passengers at time of check-in. There is no floor storage for this seat during takeoff and landing. The tray table and inflight entertainment monitor are in the armrest, making the armrest immovable and slightly reducing seat width. 30 B None No Power Seat 30 B is a standard Economy Class seat that has extra legroom due to the position of the bulkhead. There is no floor storage for this seat during takeoff and landing. The tray table and inflight entertainment monitor are in the armrest, making the armrest immovable and slightly reducing seat width. 30 C None No Power Seat 30 C is a standard Economy Class seat that has extra legroom due to the position of the bulkhead. Delta designates this seat as a Preferred Seat, which is reserved for Delta Medallion members. This seat may be selected by Medallion members at time of booking or afterwards. This seat becomes available to all passengers at time of check-in. There is no floor storage for this seat during takeoff and landing. The tray table and inflight entertainment monitor are in the armrest, making the armrest immovable and slightly reducing seat width. 30 D None No Power Seat 30 D is a standard Economy Class seat that has extra legroom due to the position of the bulkhead. Delta designates this seat as a Preferred Seat, which is reserved for Delta Medallion members. This seat may be selected by Medallion members at time of booking or afterwards. This seat becomes available to all passengers at time of check-in. There is no floor storage for this seat during takeoff and landing. The tray table and inflight entertainment monitor are in the armrest, making the armrest immovable and slightly reducing seat width. 30 E None No Power Seat 30 E is a standard Economy Class seat that has extra legroom due to the position of the bulkhead. There is no floor storage for this seat during takeoff and landing. The tray table and inflight entertainment monitor are in the armrest, making the armrest immovable and slightly reducing seat width. 30 F None No Power Seat 30 F is a standard Economy Class seat that has extra legroom due to the position of the bulkhead. Delta designates this seat as a Preferred Seat, which is reserved for Delta Medallion members. This seat may be selected by Medallion members at time of booking or afterwards. This seat becomes available to all passengers at time of check-in. There is no floor storage for this seat during takeoff and landing. The tray table and inflight entertainment monitor are in the armrest, making the armrest immovable and slightly reducing seat width. 30 G None No Power Seat 30 G is a standard Economy Class seat that has extra legroom due to the position of the bulkhead. Delta designates this seat as a Preferred Seat, which is reserved for Delta Medallion members. This seat may be selected by Medallion members at time of booking or afterwards. This seat becomes available to all passengers at time of check-in. There is no floor storage for this seat during takeoff and landing. The tray table and inflight entertainment monitor are in the armrest, making the armrest immovable and slightly reducing seat width. 30 H None No Power Seat 30 H is a standard Economy Class seat that has extra legroom due to the position of the bulkhead. 30 J None No Power Seat 30 J is a standard Economy Class seat that has extra legroom due to the position of the bulkhead. Delta designates this seat as a Preferred Seat, which is reserved for Delta Medallion members. This seat may be selected by Medallion members at time of booking or afterwards. This seat becomes available to all passengers at time of check-in. There is no floor storage for this seat during takeoff and landing. The tray table and inflight entertainment monitor are in the armrest, making the armrest immovable and slightly reducing seat width. 31 A None No Power Seat 31 A is a standard Economy Class seat. Delta designates this seat as a Preferred Seat, which is reserved for Delta Medallion members. This seat may be selected by Medallion members at time of booking or afterwards. 31 C None No Power Seat 31 C is a standard Economy Class seat. Delta designates this seat as a Preferred Seat, which is reserved for Delta Medallion members. This seat may be selected by Medallion members at time of booking or afterwards. 31 D None No Power Seat 31 D is a standard Economy Class seat. Delta designates this seat as a Preferred Seat, which is reserved for Delta Medallion members. This seat may be selected by Medallion members at time of booking or afterwards. 31 F None No Power Seat 31 F is a standard Economy Class seat. Delta designates this seat as a Preferred Seat, which is reserved for Delta Medallion members. This seat may be selected by Medallion members at time of booking or afterwards. 31 G None No Power Seat 31 G is a standard Economy Class seat. Delta designates this seat as a Preferred Seat, which is reserved for Delta Medallion members. This seat may be selected by Medallion members at time of booking or afterwards. 31 J None No Power Seat 31 J is a standard Economy Class seat. Delta designates this seat as a Preferred Seat, which is reserved for Delta Medallion members. This seat may be selected by Medallion members at time of booking or afterwards. 32 A None No Power Seat 32 A is a standard Economy Class seat. Delta designates this seat as a Preferred Seat, which is reserved for Delta Medallion members. 32 C None No Power Seat 32 C is a standard Economy Class seat. Delta designates this seat as a Preferred Seat, which is reserved for Delta Medallion members. This seat may be selected by Medallion members at time of booking or afterwards. 32 D None No Power Seat 32 D is a standard Economy Class seat. Delta designates this seat as a Preferred Seat, which is reserved for Delta Medallion members. This seat may be selected by Medallion members at time of booking or afterwards. 32 F None No Power Seat 32 F is a standard Economy Class seat. Delta designates this seat as a Preferred Seat, which is reserved for Delta Medallion members. This seat may be selected by Medallion members at time of booking or afterwards. 32 G None No Power Seat 32 G is a standard Economy Class seat. Delta designates this seat as a Preferred Seat, which is reserved for Delta Medallion members. This seat may be selected by Medallion members at time of booking or afterwards. 32 J None No Power Seat 32 J is a standard Economy Class seat. Delta designates this seat as a Preferred Seat, which is reserved for Delta Medallion members. This seat may be selected by Medallion members at time of booking or afterwards. 33 A None No Power Seat 33 A is a standard Economy Class seat. Delta designates this seat as a Preferred Seat, which is reserved for Delta Medallion members. 33 C None No Power Seat 33 C is a standard Economy Class seat. Delta designates this seat as a Preferred Seat, which is reserved for Delta Medallion members. This seat may be selected by Medallion members at time of booking or afterwards. 33 D None No Power Seat 33 D is a standard Economy Class seat. Delta designates this seat as a Preferred Seat, which is reserved for Delta Medallion members. This seat may be selected by Medallion members at time of booking or afterwards. 33 F None No Power Seat 33 F is a standard Economy Class seat. Delta designates this seat as a Preferred Seat, which is reserved for Delta Medallion members. This seat may be selected by Medallion members at time of booking or afterwards. 33 G None No Power Seat 33 G is a standard Economy Class seat. Delta designates this seat as a Preferred Seat, which is reserved for Delta Medallion members. This seat may be selected by Medallion members at time of booking or afterwards. 33 J None No Power Seat 33 J is a standard Economy Class seat. Delta designates this seat as a Preferred Seat, which is reserved for Delta Medallion members. This seat may be selected by Medallion members at time of booking or afterwards. 39 A None No Power Seat 39 A is a standard Economy Class seat however, the proximity to the lavatories may be bothersome. 39 B None No Power Seat 39 B is a standard Economy Class seat however, the proximity to the lavatories may be bothersome. 39 C None No Power Seat 39 C is a standard Economy Class seat however, the proximity to the lavatories may be bothersome. 39 F None No Power Seat 39 F is a standard Economy Class seat however, the proximity to the lavatories may be bothersome. 4 A None No Power Seat 4 A is a standard Delta One Open Suite. 4 B None No Power Seat 4 B is a standard Delta One Open Suite. 4 C None No Power Seat 4 C is a standard Delta One Open Suite. 4 D None No Power Seat 4 D is a standard Delta One Open Suite. 40 B None No Power Seat 40 B is a standard Economy Class seat that has extra legroom, however, the proximity to the lavatories may be bothersome. There is no floor storage for this seat during takeoff and landing. The tray table and inflight entertainment monitor are in the armrest, making the armrest immovable and slightly reducing seat width. 40 C None No Power Seat 40 C is a standard Economy Class seat that has extra legroom, however, the proximity to the lavatories may be bothersome. There is no floor storage for this seat during takeoff and landing. The tray table and inflight entertainment monitor are in the armrest, making the armrest immovable and slightly reducing seat width. 40 D None No Power Seat 40 D is a standard Economy Class seat that has extra legroom, however, the proximity to the lavatories may be bothersome. There is no floor storage for this seat during takeoff and landing. The tray table and inflight entertainment monitor are in the armrest, making the armrest immovable and slightly reducing seat width. 40 E None No Power Seat 40 E is a standard Economy Class seat that has extra legroom, however, the proximity to the lavatories may be bothersome. There is no floor storage for this seat during takeoff and landing. The tray table and inflight entertainment monitor are in the armrest, making the armrest immovable and slightly reducing seat width. 40 F None No Power Seat 40 F is a standard Economy Class seat that has extra legroom, however, the proximity to the lavatories may be bothersome. There is no floor storage for this seat during takeoff and landing. The tray table and inflight entertainment monitor are in the armrest, making the armrest immovable and slightly reducing seat width. 40 G None No Power Seat 40 G is a standard Economy Class seat that has extra legroom, however, the proximity to the lavatories may be bothersome. There is no floor storage for this seat during takeoff and landing. The tray table and inflight entertainment monitor are in the armrest, making the armrest immovable and slightly reducing seat width. 40 H None No Power Seat 40 H is a standard Economy Class seat that has extra legroom, however, the proximity to the lavatories may be bothersome. There is no floor storage for this seat during takeoff and landing. The tray table and inflight entertainment monitor are in the armrest, making the armrest immovable and slightly reducing seat width. 41 A None No Power Seat 41 A is a standard Economy Class seat that has additional legroom. 41 J None No Power Seat 41 J is a standard Economy Class seat that has additional legroom. 5 A None No Power Seat 5 A is a standard Delta One Open Suite. 5 B None No Power Seat 5 B is a standard Delta One Open Suite. 5 C None No Power Seat 5 C is a standard Delta One Open Suite. 5 D None No Power Seat 5 D is a standard Delta One Open Suite. 54 A None No Power Seat 54 A is a standard Economy Class seat located in the last row of the aircraft. Seat back recline might be limited due to the wall of a bulkhead directly behind. Also, if the seat back in front is reclined, then there will be a reduction of personal space. The proximity to the galley and lavatory area might be bothersome. 54 B None No Power Seat 54 B is a standard Economy Class seat located in the last row of the aircraft. Seat back recline might be limited due to the wall of a bulkhead directly behind. Also, if the seat back in front is reclined, then there will be a reduction of personal space. The proximity to the galley and lavatory area might be bothersome. 54 C None No Power Seat 54 C is a standard Economy Class seat located in the last row of the aircraft. Seat back recline might be limited due to the wall of a bulkhead directly behind. Also, if the seat back in front is reclined, then there will be a reduction of personal space. The proximity to the galley and lavatory area might be bothersome. 54 D None No Power Seat 54 D is a standard Economy Class seat. The proximity to the lavatory and galley might be bothersome. 54 F None No Power Seat 54 F is a standard Economy Class seat. The proximity to the lavatory and galley might be bothersome. 54 G None No Power Seat 54 G is a standard Economy Class seat located in the last row of the aircraft. Seat back recline might be limited due to the wall of a bulkhead directly behind. Also, if the seat back in front is reclined, then there will be a reduction of personal space. The proximity to the galley and lavatory area might be bothersome. 54 H None No Power Seat 54 H is a standard Economy Class seat located in the last row of the aircraft. Seat back recline might be limited due to the wall of a bulkhead directly behind. Also, if the seat back in front is reclined, then there will be a reduction of personal space. The proximity to the galley and lavatory area might be bothersome. 54 J None No Power Seat 54 J is a standard Economy Class seat located in the last row of the aircraft. Seat back recline might be limited due to the wall of a bulkhead directly behind. Also, if the seat back in front is reclined, then there will be a reduction of personal space. The proximity to the galley and lavatory area might be bothersome. 55 D None No Power Seat 55 D is a standard Economy Class seat located in the last row of the aircraft. Seat back recline might be limited due to the wall of a bulkhead directly behind. Also, if the seat back in front is reclined, then there will be a reduction of personal space. The proximity to the galley and lavatory area might be bothersome. 55 E None No Power Seat 55 E is a standard Economy Class seat located in the last row of the aircraft. Seat back recline might be limited due to the wall of a bulkhead directly behind. Also, if the seat back in front is reclined, then there will be a reduction of personal space. The proximity to the galley and lavatory area might be bothersome. 55 F None No Power Seat 55 F is a standard Economy Class seat located in the last row of the aircraft. Seat back recline might be limited due to the wall of a bulkhead directly behind. Also, if the seat back in front is reclined, then there will be a reduction of personal space. The proximity to the galley and lavatory area might be bothersome. 6 A None No Power Seat 6 A is a standard Delta One Open Suite. 6 B None No Power Seat 6 B is a standard Delta One Open Suite. 6 C None No Power Seat 6 C is a standard Delta One Open Suite. 6 D None No Power Seat 6 D is a standard Delta One Open Suite. 7 A None No Power Seat 7 A is a standard Delta One Open Suite. 7 B None No Power Seat 7 B is a standard Delta One Open Suite. 7 C None No Power Seat 7 C is a standard Delta One Open Suite. 7 D None No Power Seat 7 D is a standard Delta One Open Suite. 8 A None No Power Seat 8 A is a standard Delta One Open Suite. 8 B None No Power Seat 8 B is a standard Delta One Open Suite. 8 C None No Power Seat 8 C is a standard Delta One Open Suite. 8 D None No Power Seat 8 D is a standard Delta One Open Suite. 9 B None No Power Seat 9 B is a standard Delta One Open Suite, however, the proximity to the lavatories and galley may be bothersome. 9 C None No Power Seat 9 C is a standard Delta One Open Suite, however, the proximity to the lavatories and galley may be bothersome. This aircraft features AVOD (Audio and Video OnDemand) for among all classes. This includes access to over 4100 MP3s and radio stations. You can bring your own single-prong headphones or purchase them onboard. This aircraft features AVOD (Audio and Video OnDemand) among all classes. This includes access to several HBO movies and over 18 satellite networks and dozens of games.You can bring your own single-prong headphones or purchase them onboard. All seats features regular AC power in every seat. 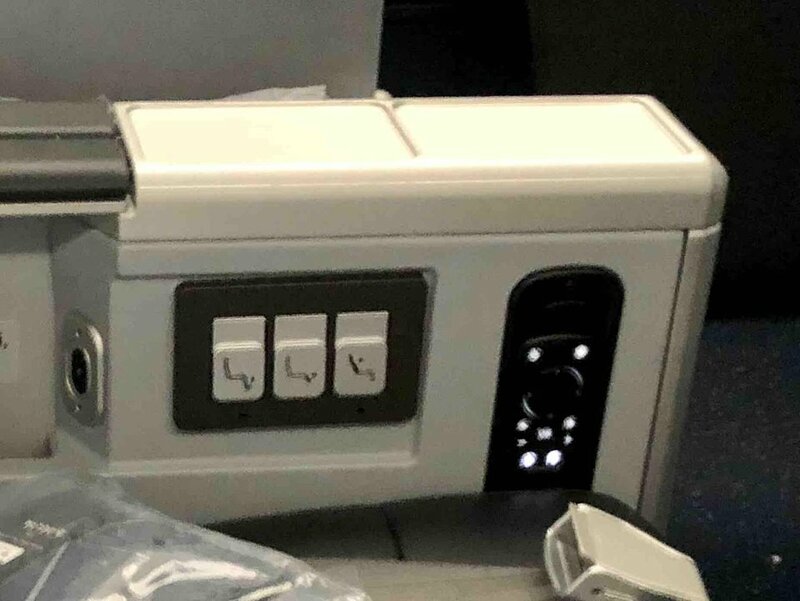 All seats feature a USB connection in your personal inseat entertainment system. Allowing you to charge multiple ellectronic devices inflight. Non-alcoholic beverages are complimentary. Beverages containing alcohol are complimentary in First, Delta Comfort+, and for passengers traveling in Economy on non-domestic U. S. flights. They may be purchased in Economy if the flight is a domestic U. S. flight. The Delta Airlines Airbus A350-900 (359) seats 306 passengers and is primarily used on International routes. This aircraft features 32 Delta One suites with flat-bed seats, 48 Delta Premium Select seats, and 226 Economy Class seats. The seat was fine and the leg room was very good. The plan layout was bad. I am saying this because you cannot walk a loop in coach. They put all the carts in the back and that blocks the walking. I was on a 12hr flight and you need to walk every 2hrs if possible. I will not rind this plane again if possible. Flew from DTW to ICN in March 2019 on A350 on seat 25H. Originally, had 20H but had switched with someone being a nice guy. Surely glad I did since I slept like a baby. The bulkhead seats had plenty of leg room but the all stowage such as the IFE is also stored on the armrest and makes it a little bulky and cramped when you extend the leg rest. Instead 25H was great despite being in the last row, it still had full/plenty recline like the other seats. The seat controls are placed a little awkward along with the head phone connection but 10 mins into the trip, you'll master the controls. It is true that with the entertainment monitor going into your armrest, the amount of seat width for just your legs is slightly reduced. Also, your entertainment monitor screen might be slightly smaller than that for other premium select seats. NRT-DTW: Good seat, except that the left support of the seat in front is rather wide , forcing your left leg slightly to the right into an awkward position. Soft product is generally superior, with Japanese meal entry actually tasting better than in Business going out. Other reviewers have made many great points re narrow aisles, overhead storage and lack of vent in middle seats but I must add that this was easily the most comfortable flat bed seat I've had in any aircraft. The foot area is comparatively spacious and padded. Also each of the meals was a small cut above the average for business class. I found no problem with operating the door. Yes, the bathrooms are small and the light in one was inoperable. The IFE screen is, as noted by others, large and responsive. Overall it was a great flight. KDTW -> ZBAA (DTW-PEK) Excellent. View was great when over the arctic, and the recline was fine. The tray table was fairly large, and the food was excellent compared to other economy meals. Business Class Seat 7C on NRT->DTW. Reviewer is a 5'10" 200lb male Positives: 1) Seat folds flat & shade between middle seats. 2) Reasonable working room for laptop & some food/drink. 3) Cabin environment was noticeably better for noise & humidity. Needs Improvement: 1) No overhead storage for center seat & limited in seat storage. 2) Since the plane is quite, you can hear everyone's conversations & anyone opening/closing doors. 3) Center seat seemed to get hot due to lack of ventilation controls. The handicap bathroom on these planes is behind row 39 GHJ seats. There's room for a wheelchair (probably a small one) - which means if you're a big guy like me, you actually have a little bit of room in the bathroom for a change. Looked forward to the DTW-PVG flight on the 350. Now that I've tried it I won;t go out of my way to fly it again. It's fine but not the travel revolution I expected. Odd number seats are further from the aisle and more private. Row 3 on the window side is far enough from the lav and galley so noise and light not a real issue. As noted, space is limited. The aisles are quite narrow and the lav is small. The suite door is a hassle to open and close. Our lav door had an issue - the light did not come on - and the crew managed to keep it lit for the entire flight whether door was opened or closed. This was a problem for the guy in seat 1B. The galley is small and the crew quarters up front so the front of the plane was a bit crowded and noisy. But DL crews are fabulous and work hard to make the experience enjoyable. This was my first opportunity selecting the Delta One class to Shanghai. For the center B positions, the odd numbered rows seem to have a larger enclosed space than the even ones (with the even rows at the C position having the larger space). I agree that the lack of overhead air vents in B/C positions is a problem, since my unit was also too hot. I left the door open most of the time. I am 6'2", and I couldn't easily get comfortable. Between the provided comforter and pillows, there really wasn't much space to put personal items when I first arrived. The IFE was superb, with a large and responsive screen. The amenities were nice. Meals and snacks were excellent. The seat arrangement for the A330-300 is much better for economy seating than the new A350. 2-4-2 ensures that you never have to bother more than one person to leave your seat. The 3-3-3 arrangement can cause two people to get up to let a window seat passenger out. Same for the 777. I will always take the A330 economy seat when given the choice. I flew from Detroit to Narita and back on PS and was extremely satisfied. It can cost twice more than economy but in my view well worth it for long transpacific flights. I'm 5'10", large build and had lots of leg room and incline. The seats were wide enough and I had adequate shoulder room. Our dedicated flight attendant took care of us and the food was tasty. The IFE screens were HUGE with lots of movies to choose from. The A350 was the quietest wide body aircraft I've been on. No need to shout to have conversations. Restrooms are tiny but not an issue. I'll definitely fly this type of aircraft and class again. The Delta One suite on the A350 is very comfortable. Odd number A and D seats are closer to their window than even number seats. There's a bit more room for your feet when in flat bed position than on some other aircraft, but there isn't any storage space. Video screen large, very responsive. I found the door to make it "private" was more trouble than it's worth. Hard to open and close, and I didn't really feel more enclosed, but people in even number seats, who sit closer to the aisle, might find it more helpful. A very nice new aircraft. And quiet! A bit of mis-aligned window. No overhead bin. Others are fine. Even though these seats offer a much wider and deeper footwell than the other suites, two large closets are immediately across the aisle from the seats themselves (as are the two DeltaOne lavatories) and the galley wall is directly above the footwells. The result is that, especially in the case of a loud (and geriatric) American crew talking and opening and closing the closets and cabinets the entire flight is noise that even earplugs and the Delta LSTN headphones cannot mask out. 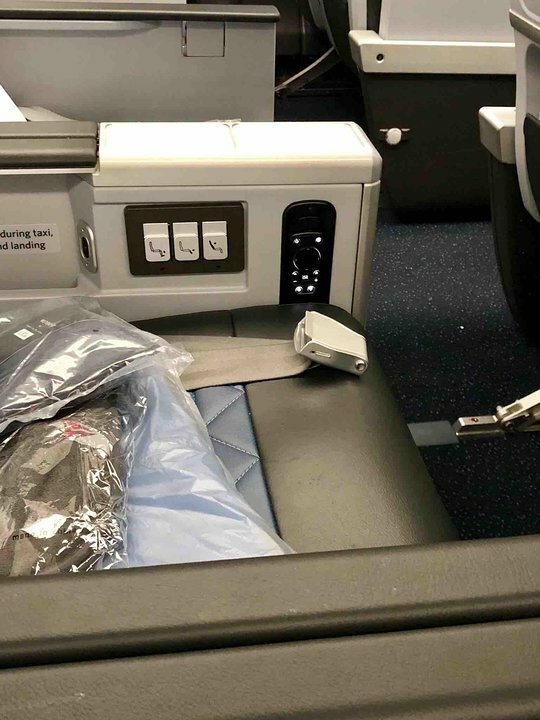 This is definitely a huge issue with packing these suites into this cabin by eliminating the buffer between the galley and the first row of seats. I find some ergometric problems: The ovehead bins on the window side extend fully laterally to the width of the seats. The bins for the middle rows are further from the aisle. During emplaning passengers subconsciously move more to the center of the plane frequently resulting in shoulder bags hitting those in seats D and G. This happened to me and I observed this on the opposite aisle also. The leg and foot rests don't work for this 6'1" passenger at maximum extension they didn't touch my calf, and the foot rest when deployed lifted my thigh clear of the front edge of the seat. 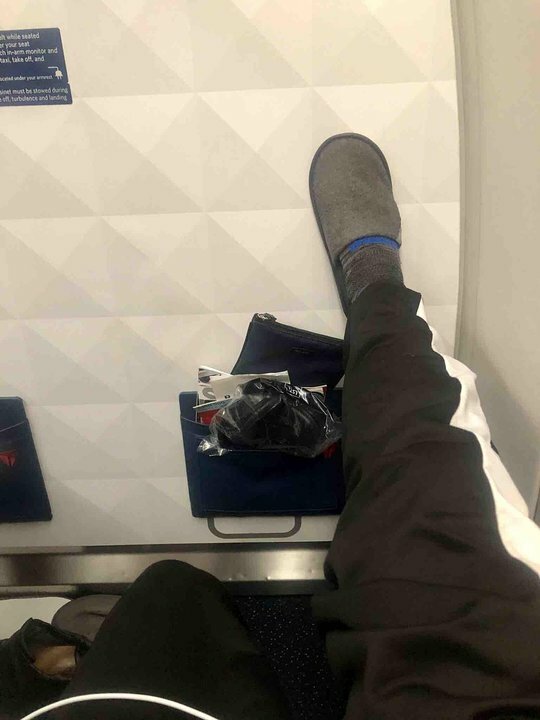 (wearing socks, not shoes) I would therefore rate all the D and G premium select seats with a caution, and make all the passengers in this section aware of the limitations of the leg and foot rests for 90th percentile height passengers. 41A and rest of row 40 and 41 are some of the worst economy seats I have been in. 41A and 41J should be in orange, and rest should be in red. Due to Delta's configuration, these rows are near the only aft lavatories of the entire economy section. Lav signs are not live, so you can't tell if it's occupied or not, causing massive amount of people waiting in the bulkhead area, more than any other aircraft in similar bulkhead rows on Delta's 777/767 and other airlines' A350. Your little extra legroom are constantly occupied by pax waiting for the restroom. In fact, waiting pax expect you to fold your legs so they can have more waiting room. You are being bumped into constantly by people and carts. The entire 12 hrs of flight, sans takeoff and landing, are full of passenger in this bulkhead area. It's also very hard to sleep because of flashes of lights from lav door being opened and noises from a lot of people traffic... Stay away from these rows if you want some sleep. 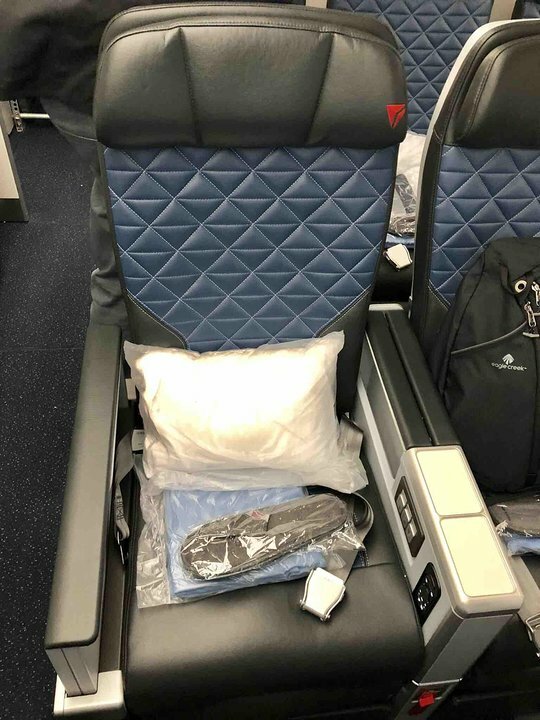 DeltaOne seats in the middle section (rows B and C) do not have a gasper (air vent) over them and especially once the door is closed, the suite can get hot. Excellent seat, has a cubby for shoes or extra storage. Roomy, full-recline, large TV, great storage for headphones, toiletries, etc. Able to use the tray without moving other items from the table and while the seat was in a semi-reclined position. One complaint was bumping the seat controls which are on the side of the pedestal with my arms which would either result in the lights coming back on or the seat moving. This was only an issue in a semi-reclined state. Otherwise it was a magnificent seat/class of service. Leg room was good in bulkhead. Lav noise was not a problem. But the seat has issues: buttons to recline and to operate the leg rest are much too easy to bump with your leg. And for front row, 110v power and usb port are in a very dumb location. I was worried I'd ruin my USB cable, it's so cramped and awkward. The IFE monitor also takes up some of the foot and leg space in an already disappointingly narrow seat. Not terribly Select or Premium, frankly. This seat has an offset window and the entertainment system continues to turn off and you have to touch it several times throughout a movie or whatever you are watching to display it. The space between the seats are smaller than other DL aircraft and there are only 4 bathrooms making for long lines. A little disappointed. I flew this aircraft from Beijing to Detroit. The economy seats on Delta's new A350 are ok but nothing special. They seem a little more cramped than a normal economy seat. Bigger video screen which is nice but it glitched for most of the flight requiring the flight attendants to have to reset it about 6 times during the flight - very annoying. Food was normal economy class food. It is also very disappointing that as a Diamond Medallion there are no complimentary upgrades to Premium Select like you can to Comfort Plus on other aircraft. Honestly, I will probably book away from this aircraft in the future. The suites are a nice touch but not perfect. Storage is almost non-existent and without overhead storage in the center section there are an excessive amount of bags in the window-side bins. The mirror under the video control door is at a useless angle. The video screen itself is excellent - large and responsive. As with all DL products, it's the crew that makes flights exceptional. Sat in 20E from DTW to NRT. I was a bit worried about being in a middle seat but the Premium Select seats have wider armrests which makes them not feel so cramped. There is enough room to get out at the front bulkhead without disturbing the person next to you. The only issue is the screen is inset in the seat near the footrest which makes my legs feel a bit cramped with the footrest down. The back row of Premium Select seems to recline just as much as the other PS seats do. Flew DTW-PEK and back on the A350 and found it to be extremely comfortable. Plane is spacious and quiet, the ride is smooth and the air doesn't seem as dehydrated somehow. PS is comparable to and perhaps a bit better than domestic first class. IFE was great - excellent screen, very responsive, nice selection. Food better than average, and they altered the selection so we didn't have the same thing on the return trip as we had had on the outbound. Better than average amenity kits. Only noted drawback is that there wasn't a ton of storage in the immediate seat areas, so while there was plenty of overhead, there wasn't a lot of room to tuck things you wanted access to. This seat was terrible. Very close to bathroom so people always making noise. Also the seat was hard as a rock for a 14 hour flight. I think the only good seats in this plane are bulkhead. Terrible seat. No overhead storage so had to stow bag several rows back. Proximity to lavatory is a big problem as people using all flight and light and odors very unpleasant. For the amount of space it takes up, the suite is cramped and very little storage. Excellent seat. Odd numbered seats in Delta One are close to the window and provide some space away from the aisle, making it a bit more quite. The sliding door is a nice touch, it's not perfect but provides noticeably more privacy than other D1 seats on other aircraft. Seat comfort is great and at full recline I can easily sleep fully stretched out (I'm 6ft). AVOD is great too, the screen is responsive and clear. Overall excellent business class product. DTW to ICN on 11/20/17. Very comfortable seat and easy to adjust. Video screen is large. The plane seems more quiet than 777 and air quality seems better. Lavatories are small. Best economy seat Ive ever flown. No seat in front and the exit door does not bother you, window alignment is excellent in seat upright and recline position for sleep. this seat has all the comfort of a window seat with direct aisle access in front of you. While i love this seat i'm not all that impressed with the A350. while the toilets are a decent size there are not enough of them, lavatory beside us regularly had 10 people in line to use it because there are no bathrooms at rear of plane. 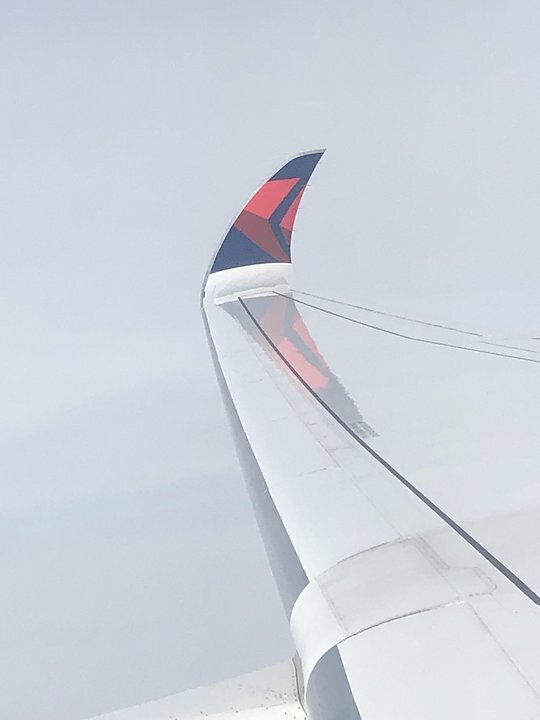 Delta flies 1 versions of Airbus A350.